Because of the versatility of a credenza desk, it's hard to make a mistake if you buy one for your home or office. For example, you can use it as a work area. Alternatively, it can also serve as storage space or for organizing purposes. A beautifully crafted credenza desk can also work as a decor element, enhancing the ambiance of the room. A credenza desk that is primarily crafted from manufactured wood. That also means that apart from being stylish, it's also an affordable option. The unit comes in either expresso oak or harvest cherry color. Aside from the appealing aesthetics, this credenza desk can offer you plenty of workspace and storage room. It comes with seven open shelves and one shelf that's covered. It also features two drawers, and one is specifically designed to accommodate folders and legal papers. With its exquisite renaissance look, this desk is sure to be a desirable piece for the lovers of the classics. What's more surprising is the desk features a hidden tech. Specifically, it comes with two USB ports and two electrical outlets to help you power your devices. Aside from the abundance of shelves and cabinets, the desk also features single built-in task lighting. It’s an excellent traditional-looking desk that offers a good mix of the old and the new. If you want to take full advantage of a corner space, then this credenza desk may be the one for you. With a rustic finish, and together with the primary material of oak veneers and rubberwood solids, it's a furniture piece that is both very durable and exceptionally stylish. The desk is an L-shape in design, providing you with plenty of work area. It features seven drawers and a quick-access document organization system. A credenza desk that’s finely crafted to exuberate classiness and luxuriousness. 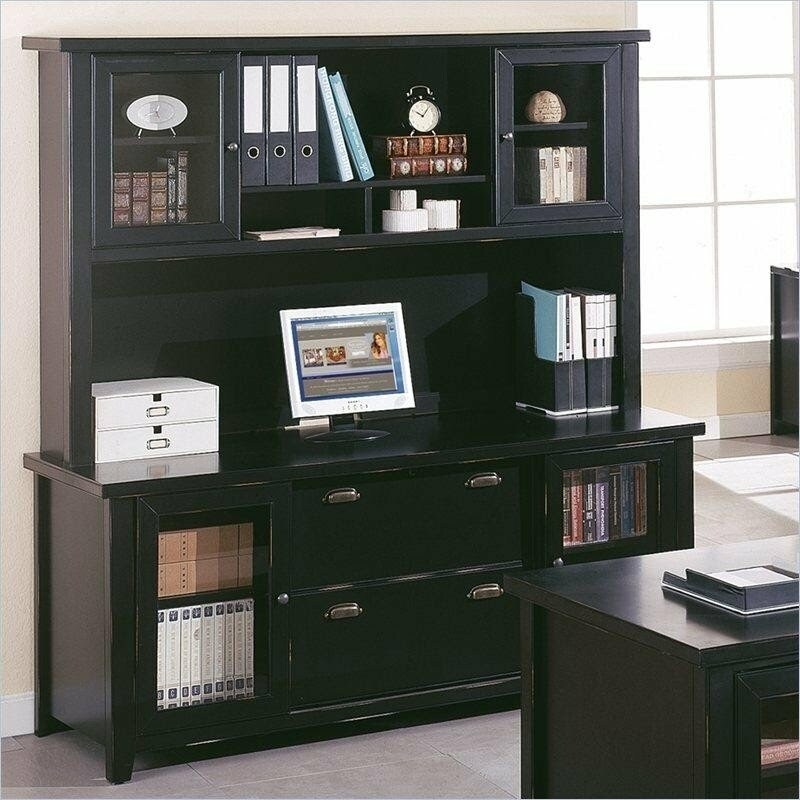 With an English cherry color and a glossy finish, it's a desk that belongs to an executive office. Another essential point that you need to know about this desk is that it's not just made to look "expensive." It is indeed a high-end desk as it's crafted from solid wood, and not from manufactured wood or plywood. If you want to tell the world that you've "made it," then this is the perfect desk to do it. If you want a desk that doesn't require any sort of assembly and looks great, then this one is an excellent option. With its dove white color and distressed wood finish, it gives off a relaxed English country vibe. The desk features two shuttered cabinet that provides bottom storage. The main desk is not as spacious compared to others, but it’s enough for most people. With five drawers and plenty of shelves, it's a piece that is both functional and aesthetically appealing. This credenza desk features a warm traditional look but can accommodate modern technology. This desk is made to last more than a lifetime thanks to the primary material being solid cherry wood. The piece comes with a strategically located "power bar" that houses two USB ports and two electrical outlets. When using this desk, you don't have to crawl or bend just so that you can power your devices. Also, all drawers feature metal glides and ball bearings to ensure longevity and smooth operation. It’s a traditionally styled desk with a hidden feature. The desk looks like a high-end credenza desk with an eye-catching hardware. And, it's indeed a top-of-the-line piece considering that it's primarily crafted from solid wood. The exciting feature of the desk is hidden behind the top-most center drawer. Pulling the drawer and out comes a tray specifically designed for a mouse and keyboard. Together with the built-in USB ports and electric outlets, it's a luxurious and classy piece that's compatible with the modern world. This furniture piece can easily be considered as the "ultimate." If you get this one, then there's no real need to buy any additional furniture. The piece features a U-shape desk that paves a way to a very spacious work area. It's very generous when it comes to the drawers so you'll hardly run out of storage space. The hutch comes with cabinets in a showcase style. It's a perfect place for displaying awards and prized possessions. A credenza desk that is not only luxurious on the outside, but also on the inside. On the exterior, the desk comes with a rich brown finish. It features finely crafted design elements including the striking hardware additions. Also, most of the drawers are lined with soft felt to protect your valuables and give the desk a comfortable feel. The hardware comes with a dark brown finish, which is a perfect match for the desk's color. The desk also comes with keyboard storage and a wire management system. A credenza desk that's a lot more than the "regular." For one, it's a double pedestal desk, and it also comes with a hutch. On top of that, it's a piece that's crafted from solid wood. In other words, it offers plenty of functionality and built to last. The desk features five drawers and three cabinets, allowing you to store a plethora of items from folders, legal-sized documents to pens. The piece gives off a vibe of warmth and coziness thanks to the cottage oak finish. The black finished hardware provides a touch of that sophisticated look. What’s the Best Credenza Desk to Buy? As you might have noticed from the list above, credenza desk come in many different types and styles. Because of the varieties, most shoppers are lost on where to begin. What you can do to make the task easier is to filter out the choices that do not apply to your situation. If you're having a bit of trouble on how to filter your choices, the buying guide below should be able to help you. One of the first things that you need to decide is the shape of the credenza desk. A credenza desk usually comes in rectangular shape, L-shape or U-shape. Rectangular Shape - A shape that is considered as the "basic." The advantage of the rectangular shape is it's easy to fit into any kind of room. It's also the most economical option, which makes it a good candidate if your budget is a bit tight. On the downside, don't expect too much with regards to the work area and storage space. U-Shape - A configuration that resembles the letter "U." Because of the size and form of the U-shape, it becomes a natural focal point of the room. It also has the advantage of providing the most desk area when compared to the other options. However, the u-shape is also the most expensive. L-Shape - A desk setup that looks like the letter "L." With regards to the desk area, it offers more space than the rectangular but not as much when compared to the u-shape. When it comes to the price, it generally sits in between the rectangular and the U-shape. One major drawback of the L-shape it's inflexible. In most cases, the shape is oriented in either left-facing or right-facing. In other words, the left-facing L-shape might work for this room, but it may not fit well with the other. The wood that's used to create a credenza desk comes in three major types. There's the solid wood, particleboard, and plywood. The reason why this factor is very crucial is because it significantly affects the price and durability. Solid Wood - A term that usually means wood that didn't undergo a gluing and/or compressing process. It has the advantage of being the most durable, but it's also the most expensive. Particleboard - A wood type that is a product of sawdust that's been glued and compressed into shape. Since sawdust is a cheap raw material, this also means that the particleboard is the most economical option when compared to solid wood and plywood. Plywood - A wood type that's a result of compressing and gluing thin sheets of wood. This wood type is more durable than fiberboard, but not as much when compared to the solid wood. However, it has the advantage of being more economical than the solid wood counterpart. Before shopping for a credenza desk, you should have an accurate size measurement. Avoid "feeling" the dimensions as it’s easy to make a mistake. You can just start by visualizing where you want to place the desk. Then, just measure the general area and make sure you write it down. When it's time to shop, make sure the desk will fit into the area you just measured.